The “clean food” movement really has taken off around the world – there’s a whole lot of juicing, spirooling, blending, steaming and fermenting going on. And a whole lot of healthy, unprocessed food being rediscovered – the sort of food that hasn’t lost too much of its nutrition, essence and energy, or “Prana” as it is known in Sanskrit, from the day it was harvested. Luckily, the clean food movement has pretty much always been the norm here in France. Most meals in fact start from scratch – that is – scratching around in the vege garden, and then straight into the pan. Fresh food is everywhere – you won’t find too many rows of canned food and ready-made meals in the supermarkets; instead there’s rows of seasonal fruit vegetables and herbs. And the supermarket is actually the second port of call, after ticking off most of the shopping list at the the farmers markets stalls. Provence as a foodie and cooking retreat destination makes so much sense, and not just in the sense of it being the spiritual home of Julia Childs, amazing as her recipes may be. It’s the ties that the region has with culinary traditions that really are very good for you, for example, the health benefits of the Mediterranean diet. And this route goes further, with many Mediterranean recipes using the same nutritional elements found in Ayurvedic recipes – Provençal recipes follow the spice route of Ayurvedic cooking – using lentils, mustard seeds, beans, cumin, turmeric, garlic, onions, and fresh herbs. The french term “Joie de vivre” – the joy of life – could also be translated as “Prana” – the energy within. When you host a yoga and cooking retreat at Villa Tropez, you’ll be serving up delicious local produce which still has most of its life energy, being grown locally in the nurturing soils. Because there’s a whole lot of Prana here in Provence. The Côte d’Azur region here is also the source of the ultra healthy Mediterranean diet – olives and olive oil, nuts and seeds, fresh seafood, the antioxidant-rich vegetables – red peppers, tomatoes, greens; the list goes on. There’s even an oliveraie, olive grove on the grounds of Villa Tropez. And with the farm-to-fork experience all around you – visiting local produce markets, gourmet food production houses, and walks through quintessentially french farming landscapes, there’s no way your Joie de vivre and Prana won’t be bubbling over in abundance. The serene grounds of Villa Tropez serve up flavours of wellness and culinary inspiration. You’ll find a copper basin full of kitchen herbs, organically grown healing herbs throughout the grounds, an oliveraie – olive grove, figs, apricots, lavender, rosemary, mint, sage, passionfruit, blackberries, prickly pear fruit and bayleaf. Just beyond the front gates you’ll discover rolling hills of Provençal vineyards, vegetable fields and ancient oak forests, for truffle hunting and foraging for seasonal berries and chestnuts. 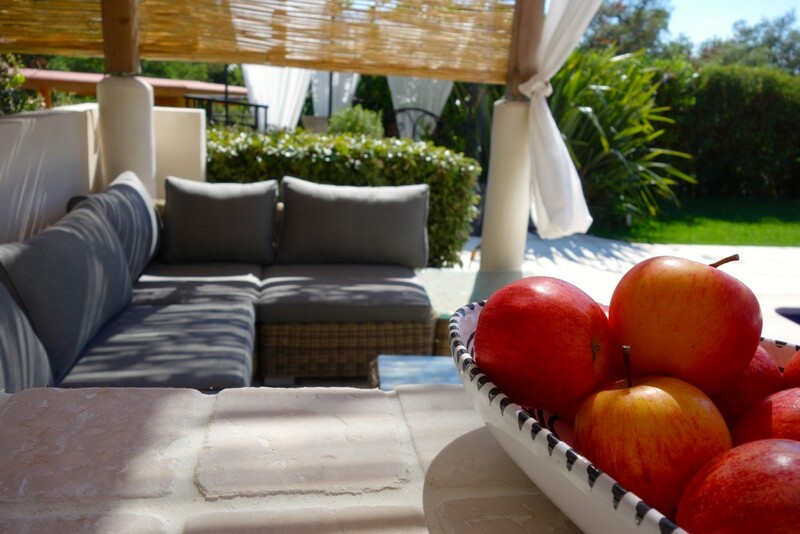 The sought after Saint Tropez hills location and abundance of gourmet and nature excursions close by makes Villa Tropez a highly popular destination, and super easy for organisers to promote their yoga and cooking retreat itinerary. Here where Provence meets the Côte d’Azur, the warmer climate is ideal for outdoor activities such as yoga, jogging, cycling, hiking, beach walks, and snorkelling. There’s so many things to add onto an itinerary for a yoga and cooking retreat. You’re spoilt for choice with dining areas inside and out, all seating up to 15, and plenty of room to hold a cooking retreat for larger groups in all seasons, with accommodation for up to 14 guests and a teacher. See the flexible accommodation layout here. Villa Tropez boasts a dedicated wellness pavilion and yoga deck on the expansive grounds, for the perfect venue for the ultimate yoga and cooking retreat. For chefs who also love yoga, the cooking facilities are fabulous, with a spacious kitchen with panoramic views, traditional outdoor pizza oven, swim up pool bar, gas BBQ, and new summer kitchenette on the olive grove terrace. This is the perfect rustic luxury villa for a group yoga and cooking retreat venue hire. Click here to view the full facilities on offer. You really can feel the culinary “joie de vivre” in this special corner of France, with the clean food movement and fresh produce, to nurture as much health and energy as possible from what’s on your plate. Prana in Provence – follow the route to wellness and book a yoga and cooking retreat at Villa Tropez. This September, an Ayurvedic nutrition and yoga retreat is being held at Villa Tropez by Renée Mann, the President of The Ayurvedic Association UK. And, it’s being held during one of the best summer weeks to go on retreat in the South of France, September 09 – 15, 2016. More than just a relaxing holiday, this Ayurvedic nutrition and yoga retreat offers 6 nights with Ayurvedic cuisine, one-one-one health consultations, a nutrition workshop, 11 yoga sessions, and four Ayurvedic massages. Alongside this holiday full of nutrition and wellness, there’s also the bonus of experiencing Saint Tropez on a boat tour. Incorporating yoga, massage and healthy eating, the retreat will leave your mind and body feeling nourished and relaxed, your spirit uplifted, and the motivation to continue on the Ayurvedic nutrition journey once you return home. There’s limited places (maximum 10) on this popular retreat to ensure one-on-one time with the Ayurvedic and yoga teacher practitioners – don’t miss out: for details and how to book, click here.